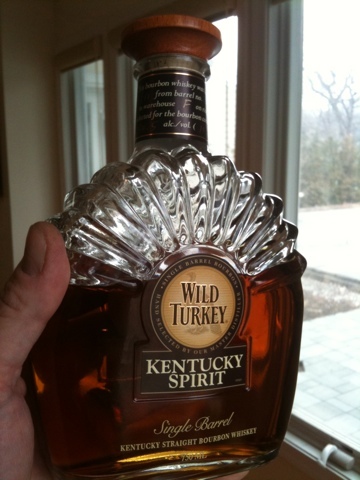 Wild Turkey is good Kentucky bourbon whiskey and Kentucky Spirit is Wild Turkey's top of the line expression in regular production: Master distiller Jimmy Russel's statement product. It's a single barrel selection with the barrel and rick numbers on each neck label served up at 101 proof to keep most of the cask goodness intact. I was expecting it to be good. It exceeded my expectations. In the glass it's a dark coppery bronze color. The nose is rich and complex and evolves strikingly through time. Time is a big factor here. This stuff is 101 proof and has a lot of alcohol to disperse. Initially, the aroma of butter - as in brown butter and buttered corn is striking. As it opens up, sweeter sherry, treacle, pecan pie, citrus and floral notes join in. It's a positively delicious aroma. First sip shows a toffee sweetness that explodes across the palate with apple flower, toffee frosting, maple candy, citrus spritz and vanilla oak. It's a paradise of plant esters in a distilled spirit. Finish is long and complex with unfolding layers of aged sawn wood, perfumed sweetness, bitter orange/dark chocolate fudgy notes and spicy spirit. The glow in my mouth lingers for many long minutes, decaying into oak and toffee coffee bittersweet. It's what bourbon is all about - yet it's quite rare at this price point. This is among the finest bourbons I've ever tried. It's right up there with rare limited editions in sophistication and distinction. Yet it treads a careful line through its disparate flavor elements, staying balanced among sweet and dry, floral and woody, bitter and sweet. What a masterful performance. I could drink it every day. Comparable quality in Scotch whiskey or French Cognac would cost multiples of what you get for less than a U.S. Grant note here in the US. Beyond the bargain aspect, the richness of flavor and complexity and balance of presentation shows that American distillery at the high end gives nothing up to the masters of the old world. This is a first rate distillate - right up there with the world's best in refinement and sheer yumminess. Jimmy Russel, I take my hat off to you.